Seen as appropriate, Sarawak ministers and assemblymen will get an astronomical pay hike of 200% with the approval of the Remuneration, Pension and Gratuities Bill 2013. Okay, Sabah maybe looking at doing the same and it won't be too surprising anymore now, would it? Remuneration to be backdated to Jan 1, 2012. Star Graphic. The state’s ministers and assemblymen have approved a whopping 200 per cent raise for themselves and administrators of the state assembly on May 21. Under the new remuneration scheme, the chief minister’s salary will increase from the present RM13,000 to RM39,000 per month while the pay of the deputy chief ministers jumps to RM35,000 from the current RM11,500. Senior ministers will receive RM30,000 in monthly salary from the present RM9,000, while ministers will see an increment from RM9,000 to RM27,000. 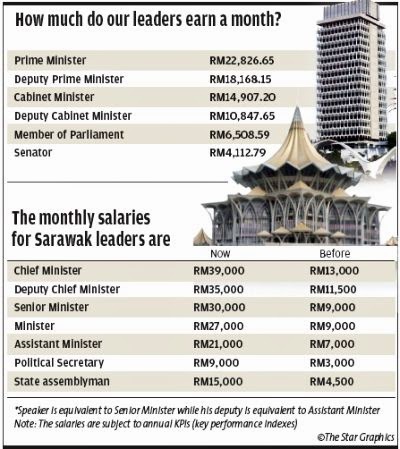 The salary of assistant ministers rises from RM7,000 to RM21,000. The basic allowance for the members of the State Legislative Assembly (DUN) will increase from RM4,500 to RM15,000 while political secretaries will see an increase in allowance from RM3,000 to RM9,000. In addition, DUN speaker will receive a salary increase equal to the senior minister while the deputy speaker will be on par with the assistant minister. The new remuneration scheme, which will be back dated to January 1, 2012, was implemented after the Members of Administration and Members of Dewan Undangan Negeri (Remuneration, Pension and Gratuities) Bill, 2013 was passed without any objection at the DUN sitting here yesterday. The new pay and allowances will increase the wage bill for the state assembly to RM17 million annually. Second Finance Minister Dato Sri Wong Soon Koh who tabled the bill said the new ordinance seeks to repeal the Members of Administration and Members of Dewan Undangan Negeri (Remuneration, Pension and Gratuities) Ordinance 1980 which came into force on July 1, 1980. “The need to revise and amend the current amount, rates and terms and conditions of the monthly allowance, salary and such other allowances and benefits is to commensurate with their status and responsibilities in the society, having regard to the current rate of inflation, standard of living and other relevant factors,”Datuk Sri Wong Soon Koh, Second Finance Minister. TheGreenMechanics: Noted. Just be prudent, we are all tax payers here.